When it's too cold to play outside, making snowmen crafts for kids can be great way to enjoy the holiday season. Most snowmen crafts for kids are fairly easy to make and can be completed in 30 minutes or less. However, you should always read the directions for a project several times before you begin. It's important to make sure you have all of the required materials and you understand exactly how the project should work. Young crafters are known for having short attention spans. If you need to stop the project in the middle to search for scissors or a bottle of glue, your children are likely to wander towards another activity. Clay and Yarn Snowmen: Combine clay and white yarn to make cute snowmen that you can enjoy all winter long. 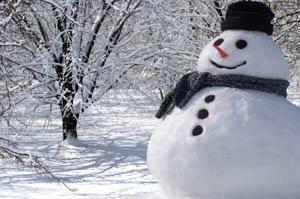 Make small snowmen for the Christmas tree or create larger snowmen to use as a holiday centerpiece. Frosty the Doorstop: A keyhole-shaped paver decorated to look like a snowman makes a nice holiday decoration or an inexpensive gift for your child's grandparents. Light Bulb Snowman: Make a Christmas ornament from a burnt out light bulb and teach your kids about the importance of recycling. Paper Mache Snowman: Paper mache can be used to create many different kinds of decorations, including this cute little snowman. Egg Snowman: Styrofoam egg snowmen add a comical touch to your Christmas décor. Stack a Snowman: This is a fun craft to make with your children if your family often gives party mix, homemade cookies, fudge, or treats to neighbors during the holidays. Fill each box with a special snack to make for a very memorable gift presentation. Brownie Snowman: Decorated brownies make a yummy holiday dessert for chocolate lovers. Popcorn Snowmen: Popcorn snowmen are inexpensive to make and sure to please a crowd of hungry children. Frosty the Cheese Ball: Serve this yummy snowman with crackers for a fun party snack. Snowman on a Stick: Snowmen made from bananas and apples are a healthier alternative to many of the sweets you see at holiday parties. Snowman Poop: It's a little crude, but children love to make this cute gift for their friends. The "snowman poop" is actually a bag of small marshmallows accompanied by a clever holiday poem. You should always plan on making a few extra snacks, since kids love to sample the treats as they are working. Make sure everyone washes their hands before they begin. Have your kids wear aprons or one of Dad's old t-shirts to keep their clothes clean. For young girls, make sure they have their hair tied back in a ponytail to keep it away from the food. If the project requires measuring, double check the measurements to make sure your children are accurate. Keep children away from knives and the stove; do your chopping ahead of time and send them off to play while the treats are baking.